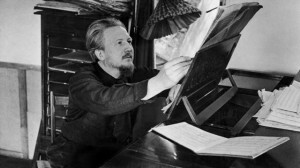 OU music PhD student Lucy Cradduck is organising a study day about the English composer Edmund Rubbra, to be held at the Royal College of Music on 6 November. Rubbra (1901–86) won an open scholarship to the Royal College of Music in 1921, where he studied composition with Gustav Holst and R.O. Morris. Although known today chiefly for his eleven symphonies and liturgical choral music, Rubbra’s compositions embrace all genres. This study day provides a rare opportunity to find out more about Rubbra’s life, work and music, including a lunchtime recital of chamber and solo instrumental works performed by RCM musicians. Spaces are still available. Registration is free, but booking is essential. Please phone the RCM box office 020 7591 4314 (Mon-Fri 10am-4pm). Foreman to talk about Rubbra as they knew him. Is it possible to put me in touch with Adrian Yardley? I used to meet Adrian at music library conferences (I was music librarian at Staffordshire). I was in touch with Adrian before he retired as my grandfather had been a friend of Rubbra when they both in their teens. By chance I am staying in Amersham the week before this event on a photographic trip to the Chilterns and I would like to be go for a walk up Highwood Bottom and see where Rubbra lived. Is the composing hut still there? Maybe Adrian could let me know exactly where it is or was??? When I walked along Highwood Bottom about five years ago, Rubbra’s composing hut was still visible at the top of the field behind his house (Valley Cottage). Hopefully, it’s still there!